The main features of the Galway recliner couch is the firm roll arm, that makes it easier for people to get out of the chair. If you have a bad back, or like a firmer back cushion, the Galway Recliner Couch has removable back cushions that can get refilled when the soft fill gets compressed over time. These are great features to ensure the longevity of your lounge suite. Manufactured using a combination of hardwood, pine and plywood to give surety of mind that your new lounge will stand the test of time. The Galway recliner couch can be produced using your choice of 100% leather or fabric. The fabric choice is either from our manufacturers range, Warwick Fabrics, or provide your own fabric if there is something special you have in mind. The Galway Recliner Couch is available from Devlin Lounges in many configurations to suit your room. You can order as a recliner, 2 seater and 3 seater – all with recliner options. 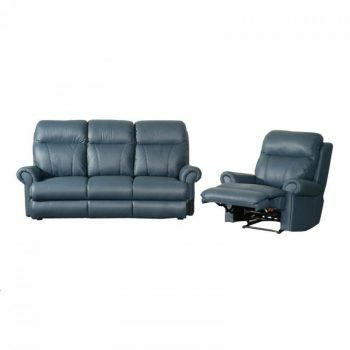 The Galway Electric Lift Recliner is a very popular model as well. All our recliner models have the electric recliner option for a small extra cost. Call on (07) 3376 1566 to ask us for a price and delivery time on your new Galway Recliner Couch.